*A guest blog by Phil Schmidt, president, Floyd B. Case, Inc.
Dub Lewis opened Dub’s Drive-In almost 65 years ago and remains a favorite stop for locals and tourists. 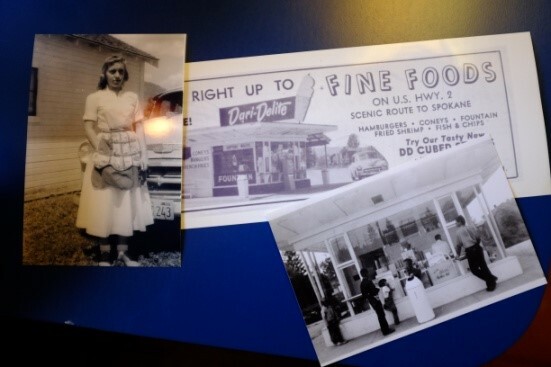 Opened in 1951 by its namesake “Dub Lewis”, Dub’s Drive-In has been a favorite stop for the people of Sandpoint, Idaho ever since. In 1987, Marty Mires purchased the restaurant after moving to Sandpoint from Florida. 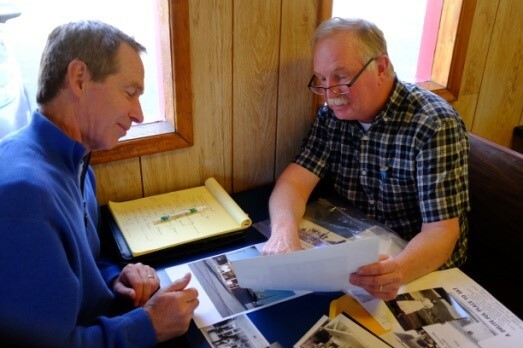 Marty’s father had retired in Sandpoint so Marty chose to follow him and was looking for something new to do. Dub’s Drive-In is located across the street from Dub’s Field where spring and summer baseball and softball are played. Many of the teams are sponsored by the eatery and they have employed high school students for so long that former employees children now work there. When Sandpoint locals are giving directions to visitors they always refer to Dub’s as a focal point – “take a right at Dub’s” or “it’s just past Dub’s on the left”. Famous for their soft serve ice cream, they serve up giant cones, sundaes, shakes, dipped cones with sprinkles and more. In the early days, they used so much dairy mix that the local dairy had to deliver soft serve mix to them every day. Even then, they ended up giving Marty a key to the plant so he could go and pick up more mix during evenings and weekends. Business was good but managing the high volume of dairy mix with their limited storage was a real problem. After extensive testing the decision was made, they switched to Frostline and never looked back. No more daily deliveries and weekend stops to the dairy. Frostline didn’t need refrigeration. Now they could offer flavors besides Vanilla and Chocolate with the flavor packets that were available with Frostline products. They only had to clean their machines once a week instead of everyday. What a huge deal! Frostline lowered their food cost by almost half. After extensive testing the decision was made, they switched to Frostline and never looked back. Now their store proudly promotes “lactose-free” soft serve and their customers are still coming in droves. The flavor packets help provide new, fun options that are great for seasonal promotions. The dairy was very sad about losing such a great customer but everyone else was thrilled! Now, Dub’s employees tell stories about how many buckets of Frostline they had to mix over the weekend (they have at least 6 buckets of vanilla and four buckets of chocolate pre-mixed and ready to go at all times). They have won awards for “best ice cream in the city”, many times, and are still the place to hang out for the local kids. Today Dub’s, under Marty’s guiding hand, has grown and added more inside space for their customers. Marty’s brother Joe opened “Serve-A-Burger” across town and uses nothing but Frostline as well. Although the car hops are gone, the wonderful sound of happy families enjoying an evening dessert after a ball game is still the norm at Dub’s. It’s hard not to be proud to be a part of such a wonderful and important institution like Dub’s and to know that we have helped them to succeed. 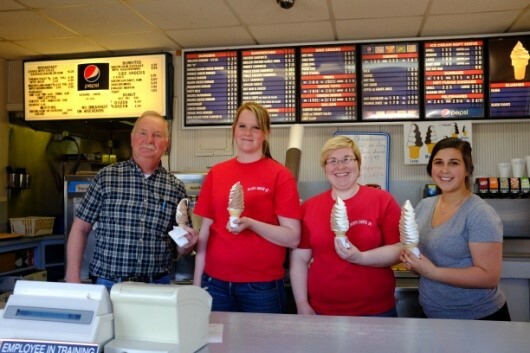 If you’re ever in northern Idaho, you must stop in for a giant cone and to say “hi” to Marty and his team. One Stop Fits All! Offering Lactose Free and Gluten Free Gives Peace of Mind! The market for lactose free and gluten-free foods and beverages is hot! With estimates that 70 –75% of the world’s population may be lactose intolerant¹ and 1 in 133 people in the U.S. are affected by Celiac Disease², operators are paying attention! Foodservice directors are adding lactose and gluten free (GF) products to their menus daily. In fact, with the rise in these two gastrointestinal conditions, all aspects of foodservice (healthcare, hotels/casinos, C&U, K-12 cafeterias, and restaurants) should take it very seriously. Colleges & Universities (C&U) are responding to the trend. For example, Oregon State University has a gluten-free webpage that directs students to food stations that offer GF menu items including frozen yogurt and smoothies. Looking to the near future, University of Nevada – Reno is adding a vegan/gluten free eatery and a self-serve frozen yogurt station to their food court this fall. Why the connection between lactose free and gluten-free? The physical symptoms someone experiences who is sensitive to either two are very similar: abdominal pain, excessive gas, cramping, bloating and nausea. A large portion of people who avoid gluten or lactose, do so primarily because of symptoms and not because of diagnosis. All they know is cause and effect; if they eat it, they suffer. For people with Celiac or gluten-sensitivity, an elimination diet is the only treatment². For lactose, there are medications that can help prevent symptoms¹. So what can you do as an operator to make the most of this rising health concern? Offer gluten free and lactose free options! In 2011, U.S. and Europe hit a combined $900 million in retail sales for lactose free products³. Gluten free was listed #2 in Time magazine’s Top 10 Food Trends of 2012. The gluten free category is expected to become worth $6.6 billion by 2017 according to Packaged Facts. 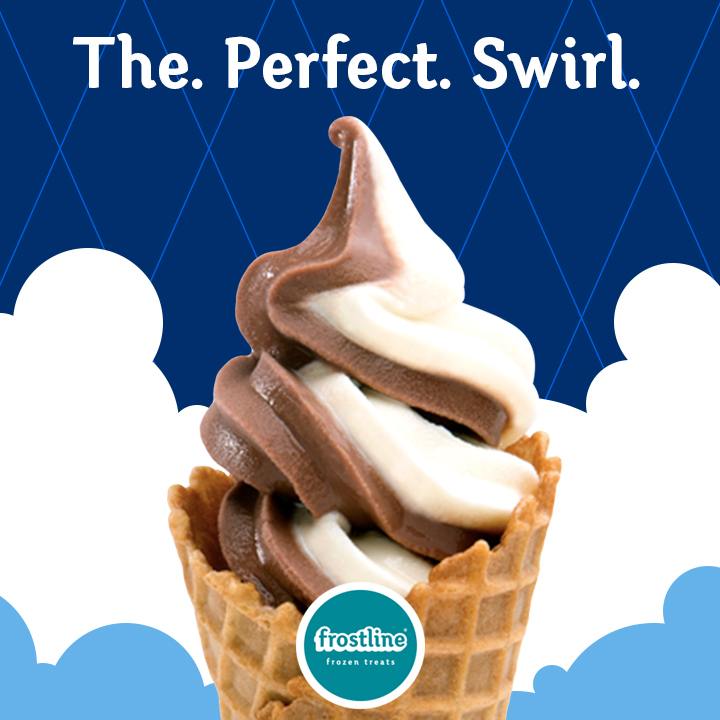 Frostline® Frozen Treats can help you in the dessert portion of your gluten free or lactose free menu. Offering soft serve that is free from these two gastrointestinal targets will not only give you peace of mind but it will enhance your menu’s image. It’s hard to find a person that doesn’t like ice cream, but some people have given it up because of their special dietary concerns. In healthcare, a bowl of soft serve is a welcome treat for patients who crave something cold and sweet but have dietary restrictions that limit their selections. C&U students have meal plans to use and self-service soft serve is a nice draw. Lastly, soft serve is a family favorite at restaurants! Restaurants can entice larger groups and families to dine-in just by offering complimentary soft serve. If you are interested in talking to someone about offering a GF or lactose free dessert, let us know! 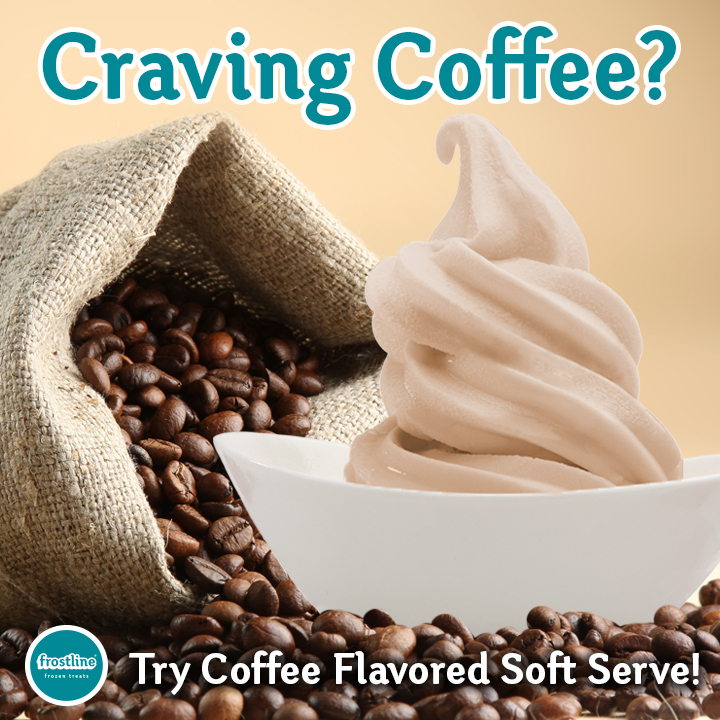 Frostline® offers soft serve mixes, frozen yogurt mixes, frozen beverage mixes (including smoothie base mix) and flavor packets. We are here to help! Swirl Won’t Curl? Seeing Ice Crystals? Let’s Fix That! Problem: Product is too soft. Symptoms: Cones won’t stand up. The soft serve looks wet. The product starts melting almost immediately. Treatment: First, check your machine’s temperature settings. We recommend setting the temperature between 18 and 21 degrees and the temperature inside the hopper be at 41 degrees. Since your soft serve seems too soft, try setting it more towards 18 degrees. If this checks out, move on to examining your scraper blades. Plastic blades should be replaced every three months and stainless blades every six. If your blades are in good shape, reexamine the mixing instructions on the bag and on the bucket. The amount of liquid you add will directly affect your soft serve texture. (Our complimentary mixing bucket has premeasured lines to help you get the mixture perfect!) If all of that is okay, we suggest contacting your soft serve machine representative for a service call. There are other mechanical issues that can cause soft serve machines to malfunction or work less efficiently. Problem: Product is too firm. Symptoms: Soft Serve texture is icy and firm. Treatment: First, check that the machine’s temperature dial is set properly. We recommend setting the temperature between 18 and 21 degrees and the temperature in the hopper be at 41 degrees. 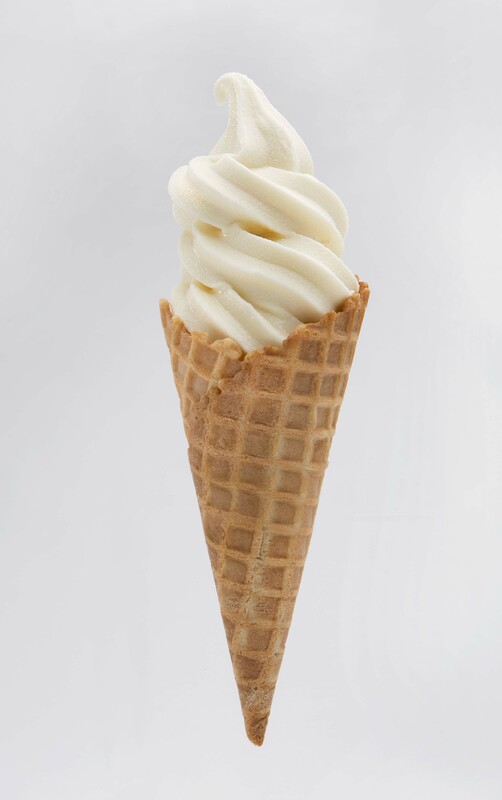 Since your soft serve seems too firm, try adjusting the temperature more towards 21 degrees. Next, confirm that your machine’s air holes and lines are clean and open. If they seem blocked, please refer to your machine’s owner’s manual for cleaning instructions. If you are still reading this, we assume you are still troubleshooting. Check the sharpness and life of your scraper blades. It is recommended that plastic blades be replaced every three months and stainless blades every six. Lastly, review the steps and measurements in our product instructions. If you think that you didn’t add enough liquid or didn’t whisk the mixture long enough, try the mixing steps again and add the new mixture to the other side of the hopper. Lastly, if you still have icy soft serve, please contact your soft serve machine representative to schedule a service call. There are other mechanical issues that can cause soft serve machines to malfunction. When you’re in the soft serve business, soft serve is always on the brain. Of course this isn’t a bad thing, however, it does lend itself to constantly thinking about the benefits of soft serve. One benefit that always comes to mind is how soft serve can instantly enhance a casual restaurant’s image as a family-friendly dining establishment. Adults and children alike seem to “save room for dessert” when they see that familiar, shiny, metal soft serve machine. That one machine has the power to turn a first-timer into a loyal customer. It has the ability to label a restaurant as “kid-friendly” faster than filling up a waffle cone. Some restaurants offer complimentary soft serve because they believe it is the key to building repeat business. Others know that offering soft serve, along with toppings or possibly chocolate sauce to make dipped cones, creates rapport among patrons. Sometimes eating out gets a bad rap by critics who feel home-cooked meals are better for family conversation. Although we agree gathering around the dining room table is definitely special; eating together at a restaurant is also a wonderful way to bond and share conversation. The key is “together”. In fact, a restaurant meal forces children to sit rather than quickly finishing their vegetables and retreating to their rooms. And if the customer is lucky enough to eat at a restaurant that offers complimentary soft serve like Sweet Tomatoes, their dining time (aka family bonding) lengthens because there is simply no way anyone can pass up FREE, all-you-can-eat soft serve! Eating together gives parents a chance to take some time to connect with their kids, model good table manners, practice gratitude, incorporate everyday consumer math into the conversation (resolving the question “why do I have to learn math”), dig a little deeper (school, work, peers, weekend plans, hopes, dreams, aspirations), and most importantly – HAVE FUN! 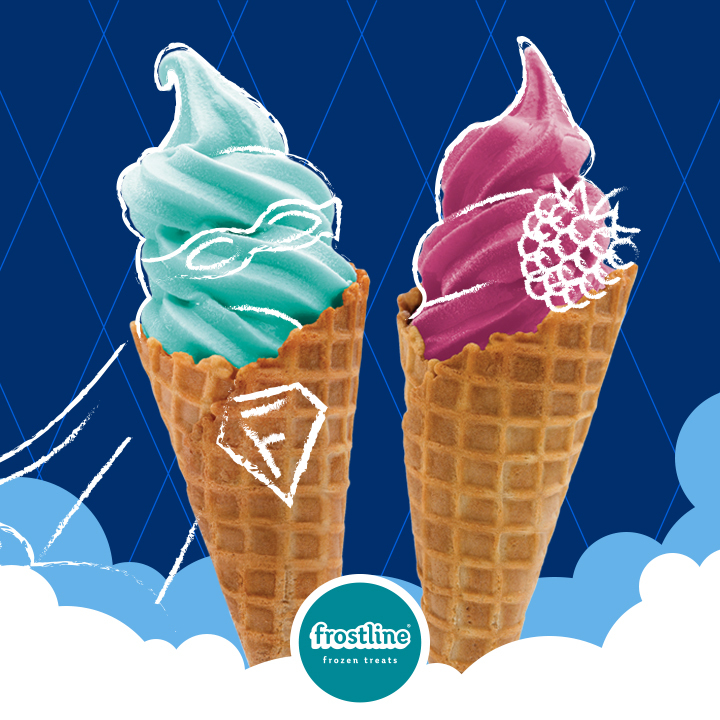 Frostline® Frozen Treats soft serve and frozen yogurt mixes operate in ALL commercial soft serve machines as well as the Rival™ home ice cream maker. ElectroFreeze, SaniServe, Stoelting and Taylor are just a few of the available brand-name machines that create perfectly frozen, delicious soft serve everyday! Soft serve machines are self-contained units that will store, churn and freeze soft serve mix into a delectable, frozen treat. If you require a medium or high volume machine for production, the machine must be able to freeze additional product to replenish what is being dispensed. Two types of commercial machines are available: gravity-fed machines and pressurized machines. Gravity-fed machines require staff to pour liquid soft serve mix into the top of the hopper and gravity pulls the mix down into the freezing cylinder. Pressurized machines follow the same loading process but an electric pump transfers the soft serve mixture into the freezing cylinder. An added benefit of a pressurized machine is the location of the hopper – usually underneath the dispensing head in a refrigerated cabinet. This location reduces spillage and physical strain when compared to the design of a gravity-fed machine. Many factors go into the purchase of a soft serve ice cream machine. You will need to know your budget, projected sales volume, space allowance, desired mixing features, and whether you want to buy new or used. 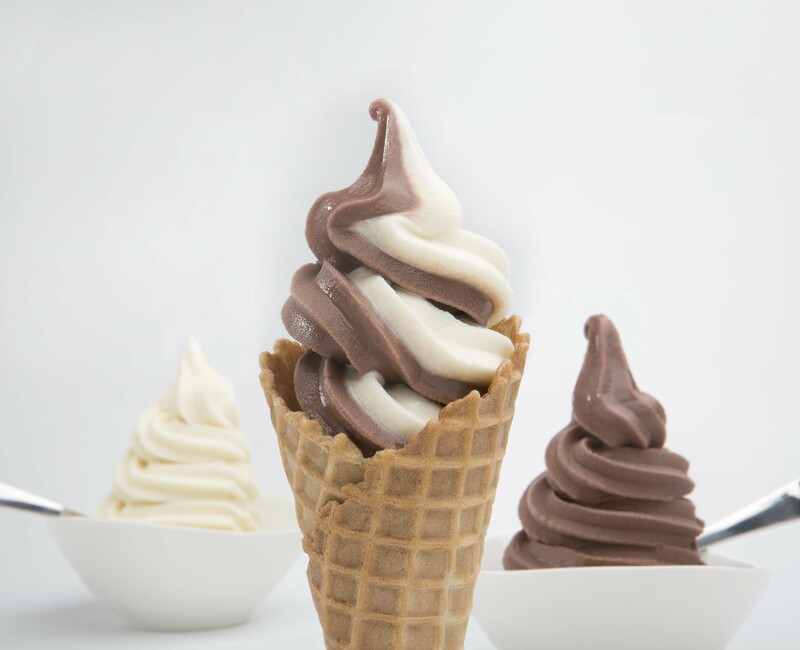 Soft serve machines vary in price, service, and reliability. The Frozen Yogurt Review has compiled reviews and a comparison chart of some of the top commercial soft serve machines. Another useful document is from Foodservice Equipment Reports. It contains an in-depth review of soft serve ice cream including history, commercial machines and health department inspections. http://www.fermag.com/sr/v12i02_sr_softserve.htm. Purchasing a soft serve machine is an investment and requires diligent research. As with any significant purchase, it is always best to shop and compare! Make sure to read customer reviews, compare warranties and identify a point of contact in case you experience difficulties with your machine. Whether you are just starting out, replacing an old machine, adding an additional machine, or just curious about dry mix; we are excited about your soft serve plans! Please let us know if you want to sample Frostline® Frozen Treat mixes. We can assure you that your customers will love the taste and your business will love the profitability and usability of our mixes. How Do You Like Us Now? We Have a New Look! Out with the old and in with the new! Frostline® Frozen Treats recently updated the brand’s look for its family of frozen treat dry mix products. Up until now, Frostline® had many logos, taglines and brand styles. Last year, a decision was made to create a fresh new logo and create a tagline that would encompass the strengths associated with the brand. The new logo’s background is a unique shade of blue with white, fluffy lettering that signifies a fun-to-serve, dreamy-textured soft serve ice cream. 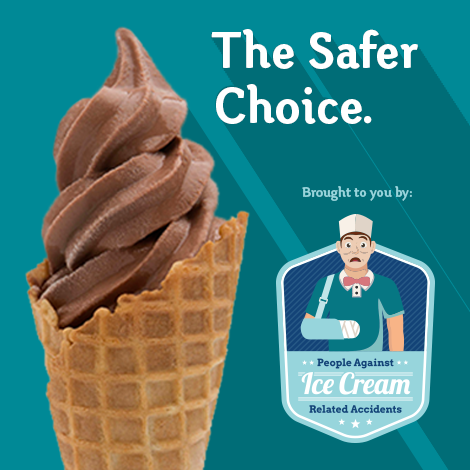 The new slogan, The Perfect Frozen Treat™, comprises the product line’s assets from consistent product quality to shelf stability to positive reputation with operators. The only change is the new look, new packaging and a renewed commitment to flavor and product innovation. 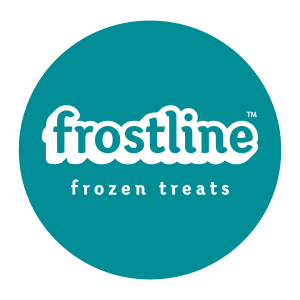 Frostline® Frozen Treats can be found at www.frostlinefrozentreats.com.